Jason Bourne, an amnesiac, tries to piece together a past he has completely forgotten. all he knows is that his body was found bullet-ridden in the water and taken to a doctor. from the doctor's analysis of his wounds, he finds out more about himself, although every answer he receives seems to pose new questions, questions about what he knows, questions about who he is, questions that could cost him his life. from the world's No. 1 storyteller comes a story of courage, skill, suspense, and survival that has appealed to millions of adventure-loving readers world-wide. This book is my absolute favourite!!! 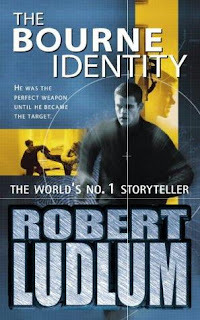 Robert Ludlum really knows how to tell a story that can pull any reader into the plot from the first couple of pages. I LOVE this book! :D It's got everything: action, adventure, mystery, suspense, heart-warming characters, killing :P, evil-doers... everything!